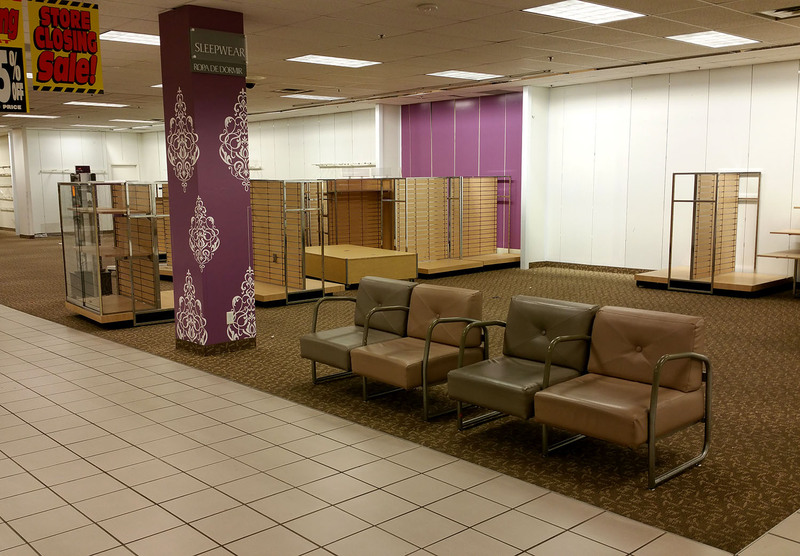 Fashion Square Mall Sears is closing. 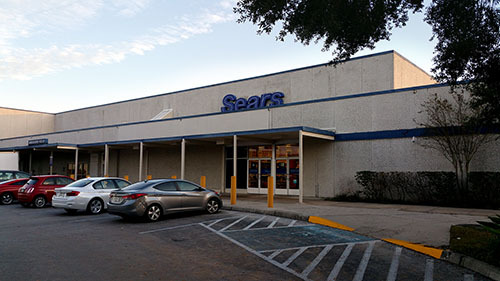 This is Sears on East Colonial Drive. 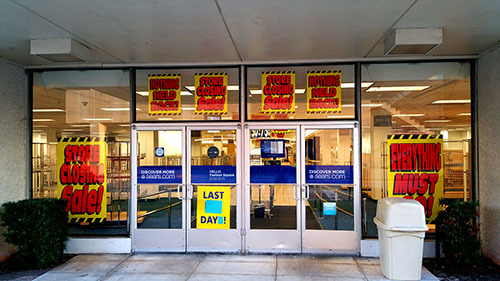 Today was the last day. Soon, it’ll be demolished to make way for something new. 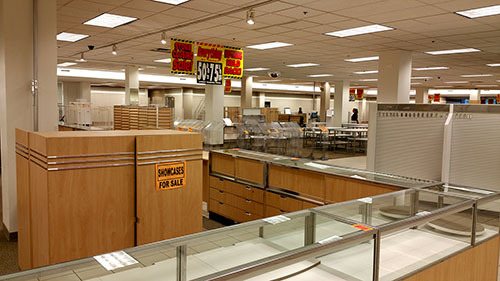 I’ll always have a soft spot for Sears and Roebuck. My mom took me there often when I was a kid. My Sears was at the Cutler Ridge Mall, back in the 1980s. 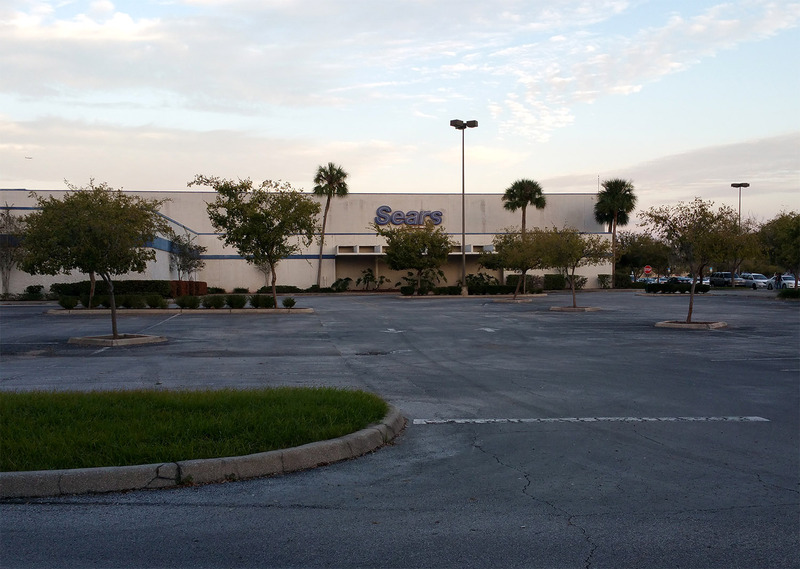 This Orlando Sears very much reminds me of that one from my youth. Same basic floor plan, although this one was built earlier, back in the early 1960s. 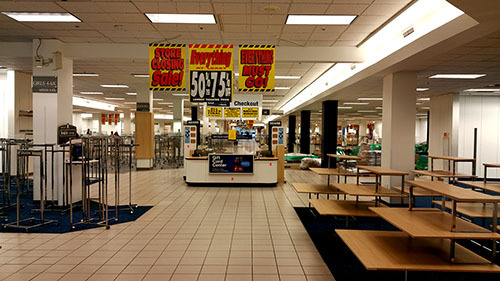 Since moving to Orlando in the early 2000s, THIS store has been my Sears. It makes me nostalgic for a variety of reasons. 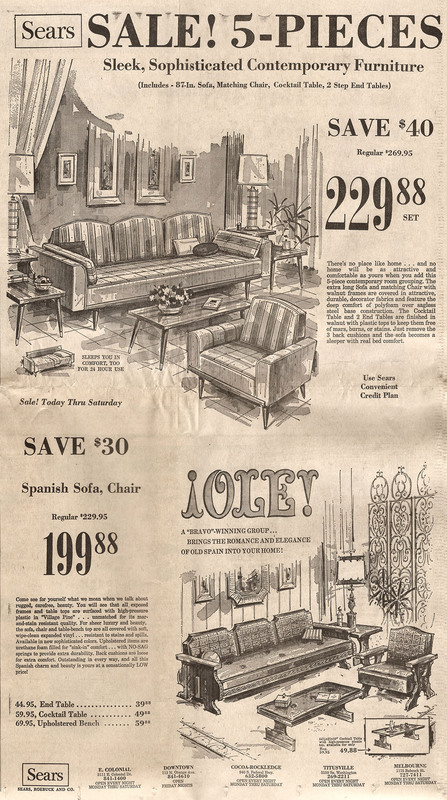 Below, I’ve attached a couple of full page Orlando newspaper ads from 1969. 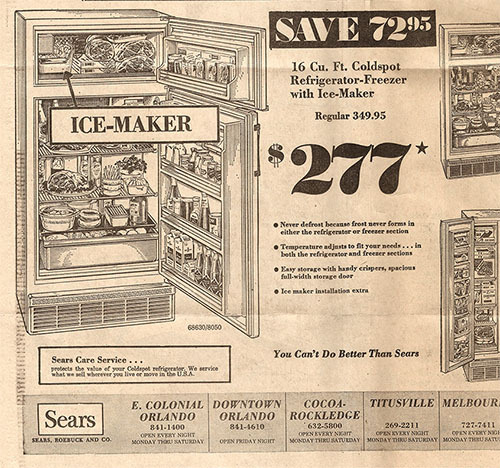 The primary Sears in town at that point was the East Colonial Drive location, and it’s featured prominently in the bottom of each ad. Click either image to get the full page ad. 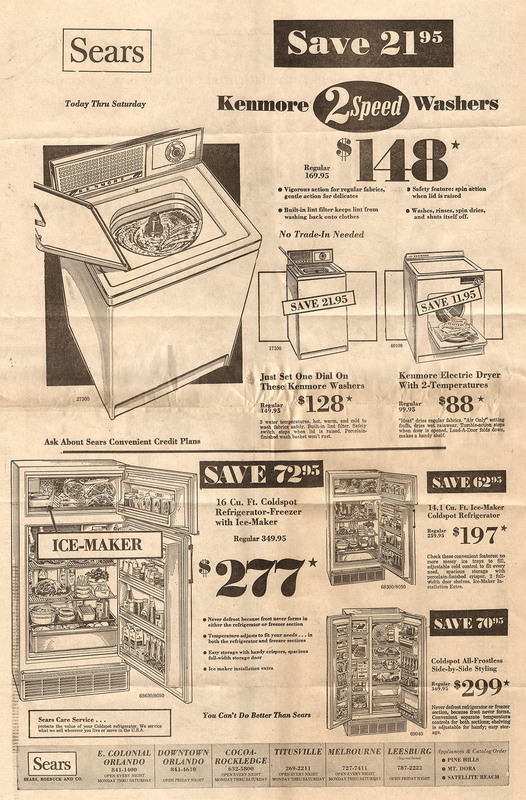 I like the fact that these ads also feature the locations of other regional Sears stores. The Downtown Orlando store, Cocoa-Rockledge, Titusville, Melbourne, Leesburg, Pine Hills, Mt. Dora and Satellite Beach. Here are some photos of Fashion Square Mall Sears on it’s last day. 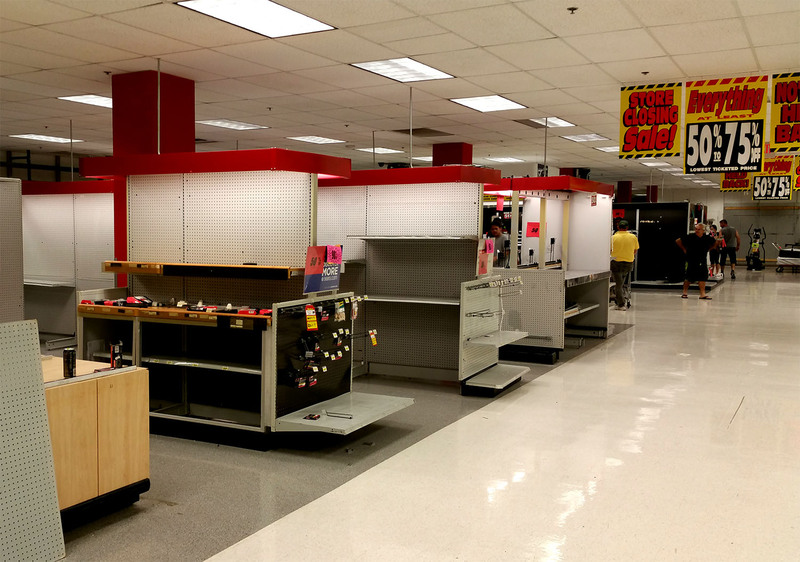 It’s a sad view of a store singing its death song. Looking at the side of the store, almost from Maguire Boulevard. The back entrance, near the tool department. I bought and coveted a lot of Craftsmen tools in this department. I spent some quality time here. 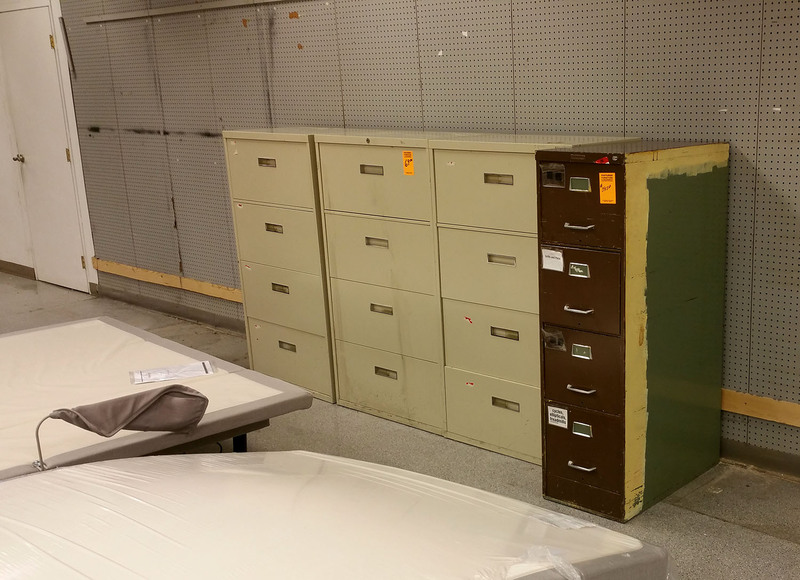 The filing cabinet on the right has been inside this Sears for a long time. Note three separate shades of paint. The green is most likely original, but there’s been new layers of brown and beige. 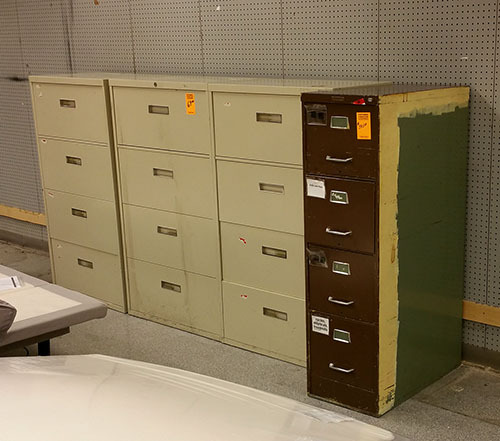 The structural lines of the handles and label frames make me think it’s from the 60s. I wouldn’t be surprised if this was an original fixture in the store. 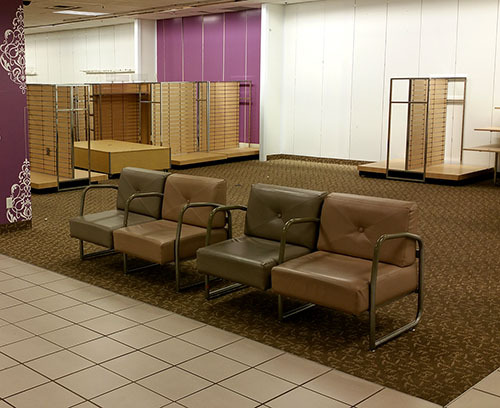 These chairs are from the shoe department, I believe. Either that, or from outside the dressing rooms. 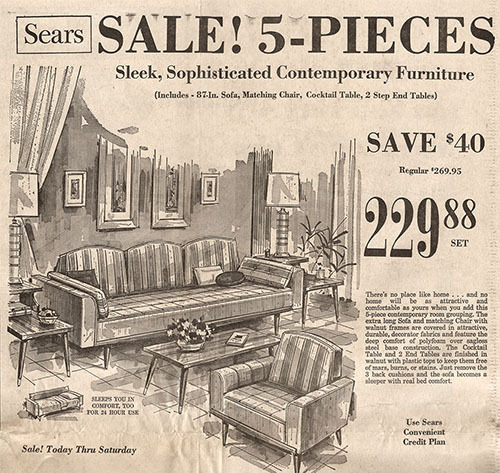 The style bespeaks the early years of this Sears. They may not be from the 1960s or 70s, but I wouldn’t bet on them being from any later than the 80s. What? 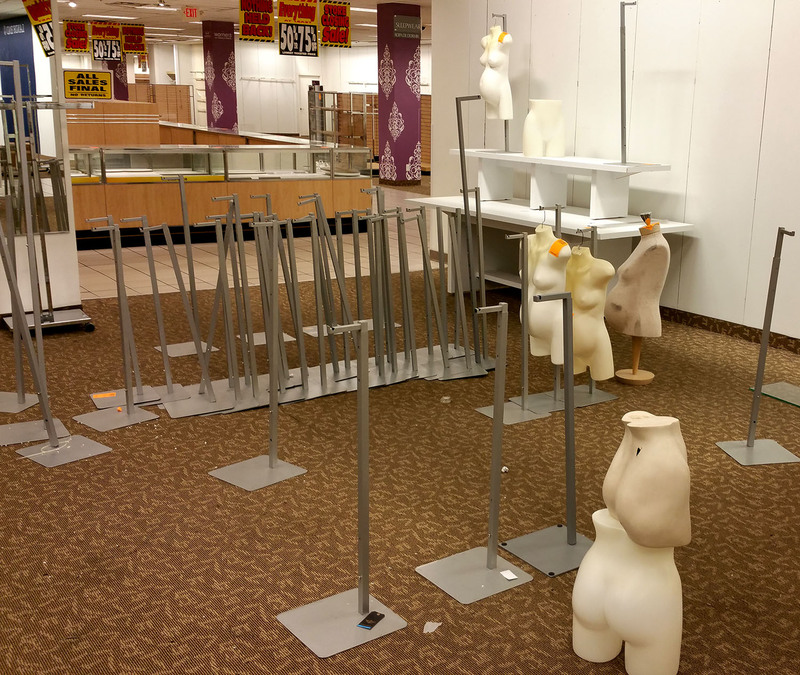 Nobody wanted these pregnant mannequins? Sometimes it’s hard to believe there was a time when the Adobe Creative Suite didn’t exist. 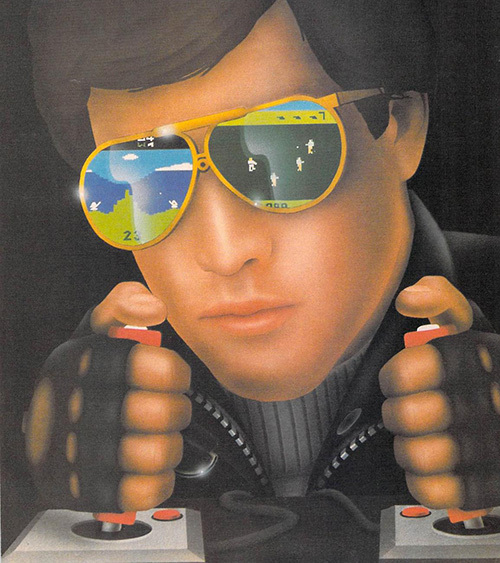 Prior to the late 1980s, if you were creating an advertisement or illustration for a magazine, cover art for a video game cartridge, a movie poster or a book cover, you did it the way it’s been done since the dawn of the retail age: ink, paint, X-Acto knives and airbrushing. This article deals with the airbrush, in particular, airbrushed video game art. 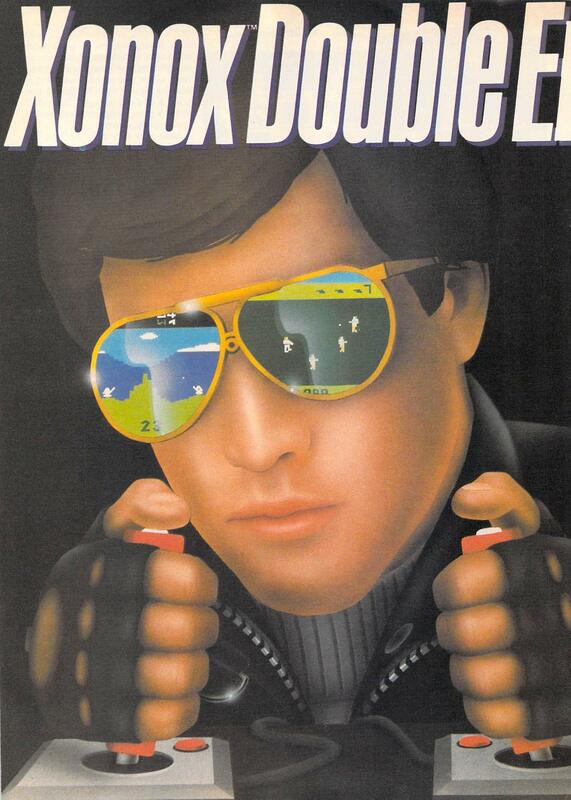 The early 1980s were the glory days of the airbrush in commercial video game art. This is partly because many of the games were so simplistic that just showing a screenshot of the game wasn’t going to turn many heads. Marketers needed a piece of art that would tell a story. A detailed piece of fantasy artwork could convince digital adventure seekers to shell out their hard earned cash or allowance. Using an airbrush enabled the artist to create art that was cutting edge, sharp, crisp and dare I say, like it came from a computer. Or whatever people imagined a art from a computer would look like. No other tool gave you the ability to quickly create sci-fi and fantasy settings with all the dimensionality, shadow, shine and glow that made it pop off the page. Of course the airbrush wasn’t limited to paper media. The movie “Tron” took place almost entirely inside a computer video game and was limited by the same constraints as print media. Only a few seconds of actual computer animation made it into the film. The rest relied on analog technology and heavy use of airbrushed matte paintings. The airbrush made it seem otherworldly. Like it hadn’t been created by hand but had been imagined into existence by some artificial intelligence. I may be overstating it. What you will see below is a mixed bag. There’s some excellent airbrushed art here, but some is downright amateurish. Given the limited budget some of these independent game publishers were dealing with, I imaging there were a lot of brother-in-laws, cousins and interns creating ad art when they weren’t quite up to the task. By the way, click the images below to see the full pages they were taken from. From Electronic Games Magazine, issue 10, 1983.